If you are looking for a home in the woods this one is for you, this home is located on an acre with large decks and hot tub. You walk into a large entry and game room with a pool table and fireplace, (in the photos you can see a Foosball game sorry it didn't work and has been removed). At the left you step down to a large living room with two couches, TV, card table, and another fireplace. A master bedroom is off to the right of the entry area with a king bed and includes a master bath with a shower. Next is another bedroom with a queen bed with a bathroom just outside the bedroom. Beyond that is a second living room with a TV and couch which is a sofa sleeper. Next to this living room is a room for all the kids, 3 bunk beds (6 twin beds), continue upstairs to a large loft with a queen size bed. At the end of the entry way is a large dining room which seats 10 but enough room to add tables to seat 20. Adjacent to the dining room is a fully stocked kitchen (to serve 30), dishwasher, oven, garbage disposal, toaster, microwave, and coffee maker. If it is not there I live next door and will get it for you.. From there you enter into a third living room and enclosed sun room. The sun room has a dining table and seating to enjoy the deck and woods, the living room has a couch and another TV and another full bathroom. From this living room you go upstairs to 2 other loft bedrooms, both have queen beds. The price quoted is for 16 occupants any over that there will be a charge of $25.00 per person per night , total of 20 max. Additionally there is a city tax of 12% not reflected within quote. This home has 3 full bathrooms and each of the 4 living rooms has high and open ceilings. This is a great home to have a family reunion, plenty of room for all! There is a very large deck in the rear yard complete with 3 BBQ's hot tub, and three tables and enough chairs for everyone. All of your towels and linens as well as your beach and hot tub towels are provided. The house is also located 1 block from bicycle rentals where you can rent bicycles and peddle to Fallen Lake and the Glen Alpine Water Falls. Only a 6 mile bike ride. The hiking trail to Angora Lakes is a 5 mile ride to the base of the trail. From there you can also enter Desolation Valley with some of the most beautiful back country in California. Shopping is 4 blocks away. The Hot Tub is available for bookings of 5 nights or more. Also the rental has parking available for 4 vehicles (maximum), street parking is not allowed. The owner lives next door and can take your booking please feel free to call him to answer any questions that may not be answered on this page. Ken (530) 541-4401. There are also some discounts available ie; May and Oct as well as last minute bookings. My wife and I are retired (me from 34 years) from the Oakland Police Dept. and we live next to this rental. Thus giving you the personal service the other rentals can not offer you. In the past 10 years we have seen most all of them and we guarantee you will be happy here, please read reviews. It will be hard for you to find more for your money than this one. I know because I have seen most all of the 20 sleepers. Not only that but I live next and will provide you with anything you might need to make your vacation perfect. Great place for Family Reunions or Large Group gatherings OTHER THAN weddings, class reunions or bachelor parties. Lake Tahoe has strict enforcement of the noise factor after 10 PM and I live next door. Central Heating and there are several available space heaters. All linens for the beds are provided. Washing Machine & Dryer are located at the rental. Off street parking is available for 5+ cars. There are enough bath towels provided for 20. There are three different Living Rooms. There are two available coffee makers. There is a pantry to store items and also spices available. Plenty of dishes & utensils for 20. Kitchen is supplied fully for 20. Table seats 10, can be extended to seat more. Total of 3 TV's in each Living Room. Basic Cable TV available with each TV. There is a Pool Table & Foosball available. Some Games & Puzzles available. There are some DVD's & VCR's available. On the Back Deck among the trees. Located in the woods on an acre. Great place for several families to stay together. Ken was a wonderful and helpful host. this was a great group of people it was a pleasure helping them find their way around Tahoe. I offered them a 1/2 stay next time. Roomy comfortable and great location. This was a nice location, convenient for food and activities. Plenty of room for a larger party. Don’t be deceived by the pretty pictures! My family rented Ken’s home for our vacation over the Fourth of July and to celebrate my mother’s 88th birthday. 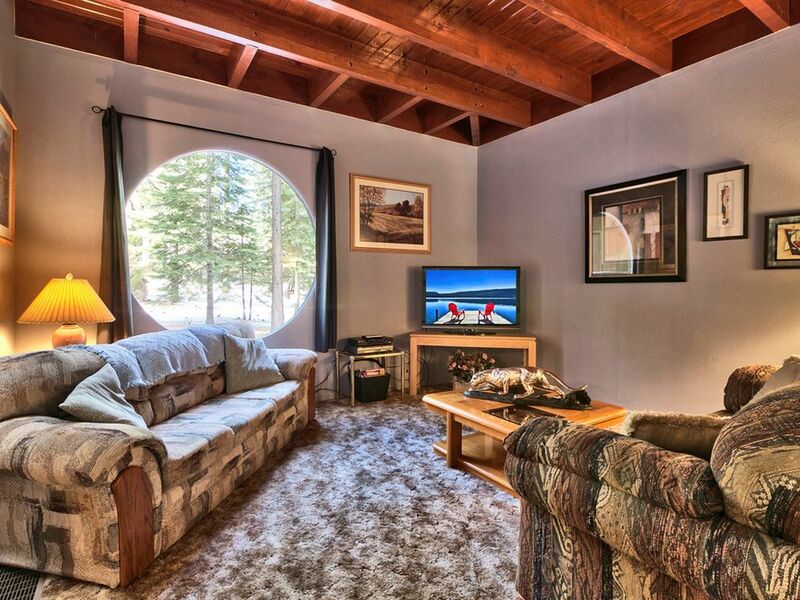 We were so looking forward to our trip as we owned a vacation home in Sourh Lake Tahoe for many years and the area held many fond memories for us. Upon arrival, Ken greeted us with his list of rules and regulations. We were very agreeable in the beginning but after a few days of his constant interference of our privacy, it got annoying. His property next door overlooks the rental property so that he has a complete view of our activities at all times. He made himself available so much that we felt his presence during our entire stay, whether it be to ask for more garbage and recycling bags to adding more water to the jacuzzi, or why the heaters don’t work properly,etc. The house is actually much smaller than described and does not offer any privacy in the lofts. He advertises six bedrooms when there are only two. It was difficult to sleep in the lofts as they got very hot at night and every little sound seemed to be magnified. The refrigerator is very small so we had to shop a few times every day to feed our crowd. We brought our dogs with us as he advertised his property as pet friendly, but then he kept most of our security deposit as he claimed that he found dog poop in the house, which was impossible as our dogs are all house trained. Sorry to leave a negative review but I have to be honest and warn any future renters so they know what to expect. We had a nice vacation in spite of Ken. In my 10 years of renting my vacation home I have never experienced people that lied on their application just to get their 5-6 dogs in my rental. When I confronted them with a copy of the rental agreement they signed stating they had NO PETS they blamed their 88 year old grandmother for the LIES on the signed agreement and then refused to pay the very small fee of $3.50 per day. With 5-6 dogs left alone in the house in the heat of the summer for a week left the house smelled like a kennel. When I reported this to VRBO I offered to provide photos of the dogs crape on my carpet and pee on the front of my new couch. VRBO returned a portion of their security deposit to make up for their LIES on their agreement. Maybe they didn’t know I lived next door and that they would get caught sneaking so many dogs in the house and not AT LEAST providing kennels for them to sleep in. These dogs were left free to wander throughout the house in the heat of the day, all day every day for 7 days while the owners were out. Their hair and smell still lingers in my home. When you live with so many dogs I think you just get use to the smell. It is just a smell I don’t want in my house and I think we just got off to a very bad start when I confronted them with a copy of the agreement telling me “THEY HAD NO PETS”. The 3 “lofts” are described very well in my VRBO web site. The refrigerator is a normal size two door. No refrigerator will hold enough food to feed 20 people for a week. Be serious! I do advertise the house as being pet friendly with a “VERY SMALL FEE of $3.50 per day”. I just expect people to be more honest and tell the truth when I asked if they have any pets. In this case they just LIED saying, “they had NO pets” and then they showed up with 5-6 dogs resulting in their mess being left in my house and on the decks. It was not a pretty sight when they finally left. Heaters work fine when turned on to “heat” and not “cool”. Running the heater only caused the upstairs “lofts” to get warm. This was the 4th of July week and 85 degrees outside which only increased the odors from huge # of dogs. My security deposit is there to protect me from people like this who say “NO PETS” then show up with 5-6 shedding crap factories. Large house and yard. Clean and equipped with everything we needed. Owner very nice and helpful with tips for activities around town. Would definitely go back again! It was a pure pleasure having this family stay at my rental. Great people and treated my home very well, would like for them to return. The house is perfect for big groups. Pictures don't do it justice. 3 living room areas. And bedroom separated thru out the house so there's some privacy. Our host, the owners of the property were very nice. They made sure our stay went smooth. Microwave went down and they replaced it asap. I would highly recommend this place and would stay there again. This rental house was very spacious and cozy! We rented this home for a family getaway which included some extended family and friends. This house has everything you could need and more than enough space for big parties. There were 3 separate gathering/family rooms with couches which was nice to have. The owners were kind enough to have everything stocked for you like ice, towels, paper towels, toilet paper etc. The location was very close to many great beaches, outdoor activities, Fallen leaf lake, shops, and casinos. The owners were very welcoming and helpful. We had such a great time and will definitely be coming back again! This family was a pleasure to have in my rental home. They were very respectful of my home and wonderful people, they get 6 stars! My wife & I live next door and try our best to help people new to Tahoe find their way around. This house sleeps 16 in beds, there are two additional sofa sleepers (queen size) available. Rental amount quoted will be for 16 people occupancy, a fee of $25.00 will be added for any guest above the 16 and up to the maximum occupancy of 20 individuals. I live (owner) next door any more than 20 individuals (the maximum occupancy) will void your contract.